Magic Penny is a developmentally appropriate, data­ driven, systematic, sequential program that empowers teachers to guide all children to develop reading, writing, and critical thinking skills. Tier I requires instruction to be evidence­based and differentiated according to a student’s assessment results. Magic Penny provides teachers with a simple assessment tool and recommends that students be formally assessed in September, January and June. The formal monitoring allows teachers to diagnose a child’s strengths and prescribe differentiated instruction in small groups with children needing similar skill development. The Magic Penny Program also provides a simple system for daily progress monitoring. This simple daily monitoring system enables a teacher to determine very quickly whether or not a child is progressing at the rate they should. This empowers teachers to make adjustments to the child’s program very quickly. By using Magic Penny, teachers can provide differentiated instruction to every child in their classroom, as well as monitor every child’s progress. This guarantees that no child will be left behind and teachers who use the Magic Penny Program do not need to refer students for Tier II or Tier III intervention. Tier II recommends that children be monitored monthly or weekly, and that lessons be taught consistently in small groups three, four, or five days per week. Magic Penny is an early literacy program that is provided every day for 20­30 minutes. The lessons are provided in small groups and monitored daily. Magic Penny was created for children who were labeled At­Risk; therefore, the program is able to meet the needs of all children. 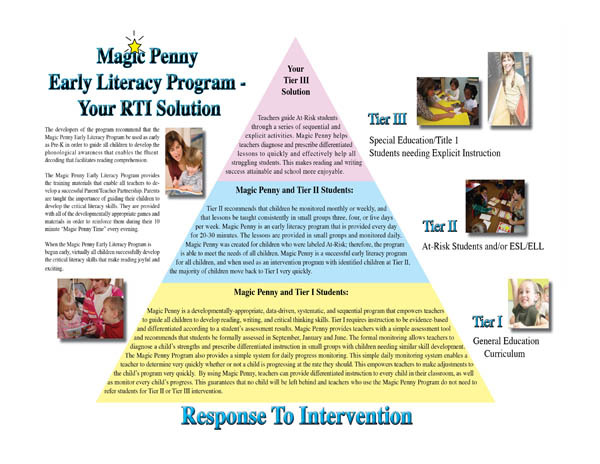 Magic Penny is a successful early literacy program for all children, and when used as an intervention program with identified children at Tier II, the majority of children move back to Tier I very quickly. Teachers guide At­Risk students through a series of sequential and explicit activities. Magic Penny helps teachers diagnose and prescribe differentiated lessons to quickly and effectively help all struggling students. This makes reading and writing success attainable and school rewarding and enjoyable.